10 Reasons Why You Need a FLEXISPOT All-in-One Deskcise Bike in your Life! — OK, I'll Give You My Opinion! If you've been following my blog then you know me and my amazingly creative other half Donnie work from home while taking care of three beautiful boys. We also embarked on the Donnie and Erica Get their Groove Back journey earlier this year. We went Keto, and I've been on a mission to find any and everything to make the work from home mom's (and dad's) life easier and balanced. On my quest I came across the FLEXISPOT All-in-One Deskcise Bike! 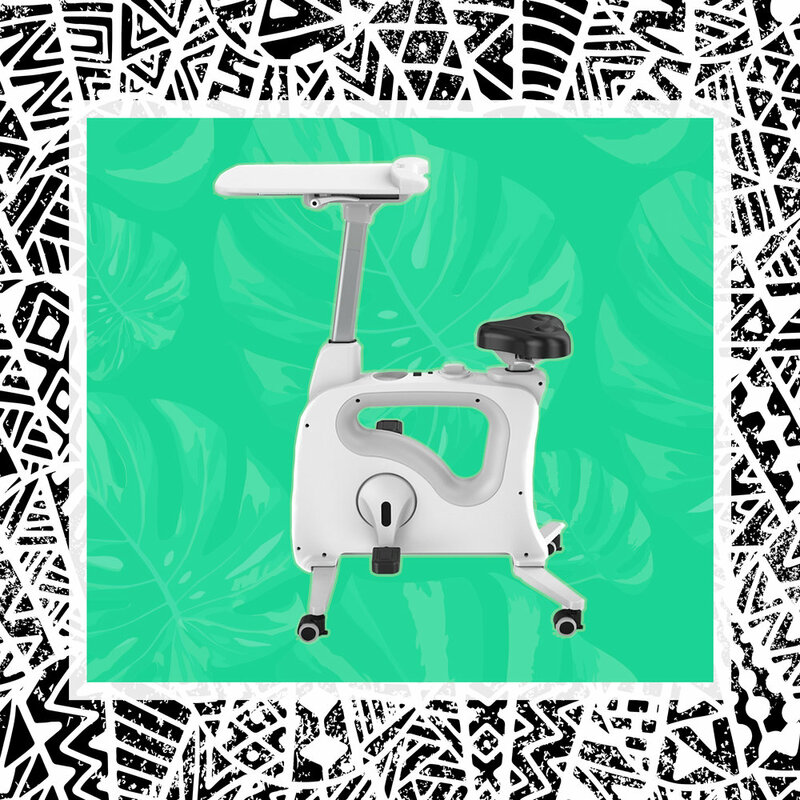 It's part standing desk, part exercise bike, and you can easily track your progress while you exercise with the integrated LCD display, which shows readouts for workout time, pedal revolutions, distance, calories burned and speed. I think this is my best find yet, and I've compiled 10 reasons why you need the Deskcise Bike in your life! 1. It improves circulation and posture. The construction of the Deskbike basically forces you to sit in an upright position in order to work effectively on the desktop. There are countless studies that confirm the dangers of sitting at a desk all day, and the toll it takes on your circulation. I’m sure the same goes for couch potato syndrome, so this was definitely an important consideration when looking into ways to improve my work from home lifestyle. Have you heard of tech neck?! I’m convinced I currently am suffering from symptoms due to my posture. The Deskbike completely shifts the way I work and sit throughout the day, and will hopefully relive some of the tension I have been experiencing. 2. Relives back pain and stress. A complaint the hubby and I both have is back pain and stress. We both work from home on our computers and being in the same position for hours is starting to really take a toll on our backs. We’re only 30, so we shouldn’t be feeling like our bodies are going downhill already right?! But my back pain and stress on my neck are things that should improve instantly with the few changes I'm making working on my Deskbike. 3. It’s super easy to assemble. I’ll be honest, my Deskbike sat in the box for about a week because I was waiting for my hubby to put it together. I didn’t even look to see what assembly required, but I just assumed it was a dad job. He’s super busy too, and I got tired of waiting so I decided to put it together myself. It literally took me ten minutes guys. No man required! 4. It’s compact, easy to move, and store. It has wheels so you can move it around. It’s compact and doesn’t take up a lot space so it doesn’t look out of place if it’s in your living room like mine. You can remove the desk portion and easily store it in a closet or under your main desk. 5. It has an adjustable desk for standing or sitting. The desk and seat are fully adjustable to create your most comfortable working position. You can work standing up on the opposite side of the bike. 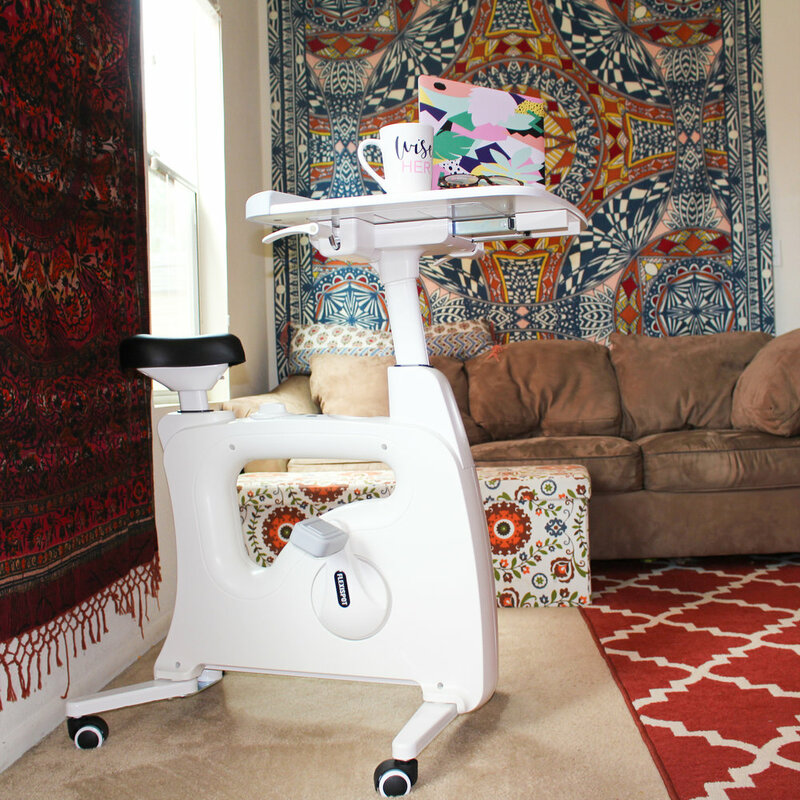 You can remove the desk, and roll the bike portion up to your stationary desk. Have you heard of all the benefits of cycling?! It significantly improves heart function, and reduces incidents of cardiovascular illness and events. It’s also great as a recovery exercise because of its low impact, and you can build endurance overtime. Cycling also increases both flexibility and muscle strength, and helps to free up stiff joints! The All-in-One Desk Bikes – Deskcise Pro™ V9 / V9U costs between $429.99 – $499.99. Stationary bikes can cost you anywhere from $100-$1000+. I actually have an elliptical/stationary bike combo in my bedroom. It’s huge, heavy, and is currently doubling as a coat hanger. Why didn’t I just utilize this machine? Well one reason is it’s in my bedroom. We spend most of our day downstairs in the living room, and it would take up too much space. When I finally make it to my bedroom, the last thing I want to do is workout to be honest. Desks! I have a desk, and an office space in my house, but it’s not in place where I can work and watch my kids at the same time. It cost me about $200, but like my elliptical, it just doesn’t get utilized with my current lifestyle. So the couch has become my workspace. I can’t leave for two minutes to use the restroom or refill my water bottle without my twins gunning straight for my computer, pens, and notebook. So if I need to leave the room for a MOMENT, I have to gather all my materials, and try to balance them and myself while I stretch over the baby gate to place the items out of reach...every time! So is $500 worth me saving all the hassles and excuses I just listed above? Yes!! In my world yes, which leads me into the next reason you need the All-in-One Desk Bike. Like I said before, my workstation is constantly disturbed while I’m trying to work. I have three boys, a four year old and 1 year old twins. My oldest knows better than to touch mommy’s stuff, but my twins on the other hand...Either one or both want to sit on my lap. Ok, that’s fine, I can multitask around a baby on my lap. No, they won’t let me. Adrian has this thing where he HAS to hold my hand while he’s sitting on my lap. Ok, I still have one hand left, but now Amir is grabbing my water bottle, and his new thing is to shake and pour out any vessel containing liquid. And let me tell you, leak proof sippy cups and water bottles don’t exist! So now I’m reaching over to grab my water, now everyone is dying of thirst all of sudden and want to drink from MY water bottle. So I put my laptop down to relive everyone’s thirst. As I’m making my rounds, a twin notices the guard has been lifted off my computer, and the next thing you know someone is tapping keys, closing it, or attempting to push it off the ottoman to see how it falls! I’m just trying to give you guys a visual, but my point is, kid proof workstation! The Deskbike has an adjustable desk, but even at its lowest setting, the twins can't reach it!! I can set up my laptop, my coffee, and even a little plant for esthetics, and they can’t mess with it! I can pee in peace! I can grab a snack or prepare a meal without worrying my little guys are getting into something. This might sound like little victories to some, but my work from home moms, I know you feel me right now! 9. Increases work productivity and efficiency. If you work from home, you know productively and efficiently are the daily goals. It can be hard to stay disciplined sometimes especially if you have three little people asking you for something every two minutes. I realized I was most productive when I worked at my desk, but with our daily schedules I rarely make it to my desk. I work faster, and I’m able to stay more focused when I work at desk. Initially I thought I might not be coordinated enough to cycle and work on photoshop at the same time, but it’s actually pretty easy to manage. I even forget I’m cycling sometimes. We all know our body releases endorphins as a reward when we exercise. Exercise helps to lower stress, anxiety, and depression. Even though I might cry, scream, shout, and make up any excuse to not work out. I fell sooooo much better after I do. Gym memberships and workout buddies are just not conducive to my lifestyle at the moment, so I need to make it work from home. I was so excited when I discovered the All-in-One Deskcise Pro™. My first thought was this is definitely going to be a game changer, and I can't wait to share it with all my fellow work from home mom friends! I’m all about multitasking, and I can’t think of a better lifestyle improvement accessory for stay at home parents. You can purchase your own Deskcise Bike on FLEXISPOT's website or from Amazon.com. July 16th is Prime Day and all FLEXISPOT products will be 30% off! That's a $150 off the Deskbike!! **This blog contains affiliate and sponsored content. If you buy something through one of those links, I'll earn a small commission with no extra cost to you! Every post is my own honest opinion regardless of compensation. Nothin’ But! the Good Stuff - Quick Fix Bars!